I was cleaning out my photo files and came across this one. It was taken at the opening of my first solo show, held last year in The Contemporary Museum Cafe. The show, called “Fabric Actions,” consisted of 60 pieces; 48 of them were small (six-by-six inch) hand dyed fabric on canvas. The rest were acrylics on canvas. Behind me are two of my shell paintings. There are four altogether and they are currently hanging at Pacific Home if you want to see them “in person.” They were hung there by Fine Art Associates, who represent my work. BTW, that’s a swing coat of my own design. It’s cotton pique, appliqued with Marimekko trees. It’s from when I had my design studio ten years ago – but it’s still in great shape. 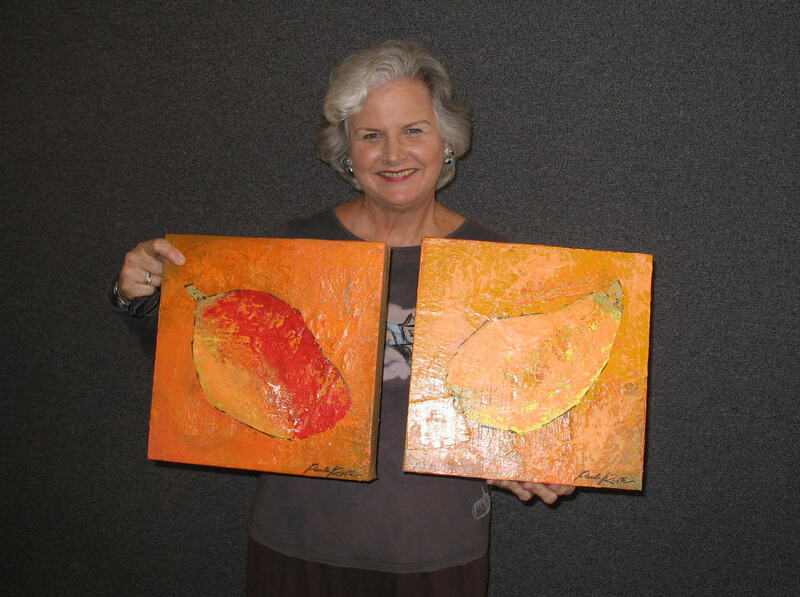 Paula with her mango (left) and papaya (right) paintings. They were sold in the Louis Pohl Gallery. 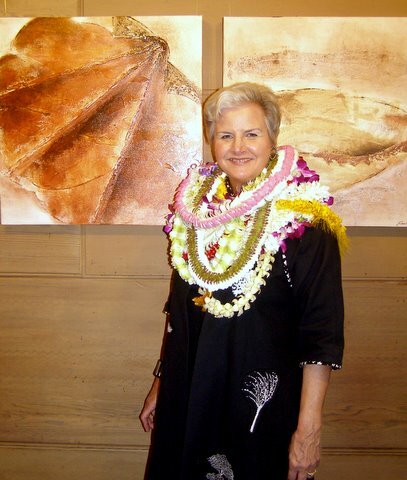 I have been working with a brighter palette since the shutdown of The Honolulu Advertiser. Perhaps it’s an attempt to make the days look sunnier. It will be fun to see if my palette changes in Greece. Aegean turquoise, perhaps? This entry was posted in Home Style, Uncategorized. Bookmark the permalink.